Knitting and crocheting have been a huge part of my life since I was a small child. I learned to knit first and instantly loved it. A few years later, my mom taught me how to crochet and I’ve been addicted to it ever since. I’m always creating some project or another and I find this time very relaxing. 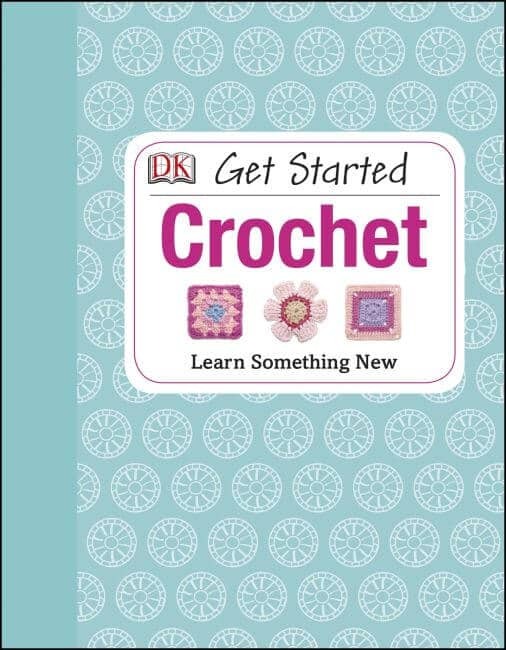 I’m always on the prowl for new craft books and DK Books has several devoted to the art of crocheting. They’re a must-have for any crocheter. Get Started Crochet is a fabulous hard covered compendium with everything you’ll need to know about crocheting. The book is divided into three sections, Start Simple, Build On It and Take It Further. If you’re new to crocheting or just want a refresher, the Start Simple is the place to begin. It will teach you about key techniques, essential equipment, natural and synthetic fibers and other equipment that you will find useful. It also teaches you yarn weight, how to make a swatch and measure your gauge and crochet abbreviations and terms. There are lots of colored illustrations and detailed instructions that will guide you on how to accomplish each crochet stitch. Once you’re comfortable with these stitches, there are several easy pattern projects included in this section that you can try. The second section, Build On It, will move you past the basic stitches. You will learn how to crochet in rounds, make Granny Squares, joining yarn, how to increase and decrease, combining stitches – shell, popcorn, and clusters, how to block a crochet piece, and how to read and follow stitch symbols. Plus, there are several new stitches you’ll learn and more interesting projects to make. The last section, Take It Further will build your crochet skills even more. You’ll learn to build on the techniques you’ve already learned, learn new stitches and advanced colorwork techniques including Jacquard and Intarsia, create intricate edging, and learn some clever new shaping skills. This book is so well laid out and will take you from being a newbie and awkward with the hook to producing quality garments for your family. I love and I’m happy to have it in my craft book collection. Secret code: tweed stitch. Crochet Step By Step is a very useful craft book for all levels of crocheters, be they newbies or seasoned crafters. Readers will learn more than 100 different crochet techniques, plus dive into 20 easy to make projects. The book is divided into four sections, Tools and Materials, Techniques, Finishing and Projects. The first section walks you through the various yarns you can use, combining colors, the variety of hook sizes and a conversion chart, yarn weight, yarn labels, and other equipment. The second section, Techniques, will take you from holding the hook to learning a diverse selection of crochet stitches and different techniques. The illustrations are clear and the instructions are detailed, yet early to understand and follow. You’ll also learn crochet terminology, abbreviations and stitch symbols. Some of the stitches featured are the filet stitch, puff stitch, shells, bobbles and clusters, picots, lace, Jacquard, Intarsia, and working with more than one color of yarn. The Unusual Yarns section will have you crocheting with string, wire, and fabric. The section called Finishing, will share how to neatly finish your project using fastenings, zippers, buttons, snaps and tassels. And the last section offers crafters twenty easy projects to create. 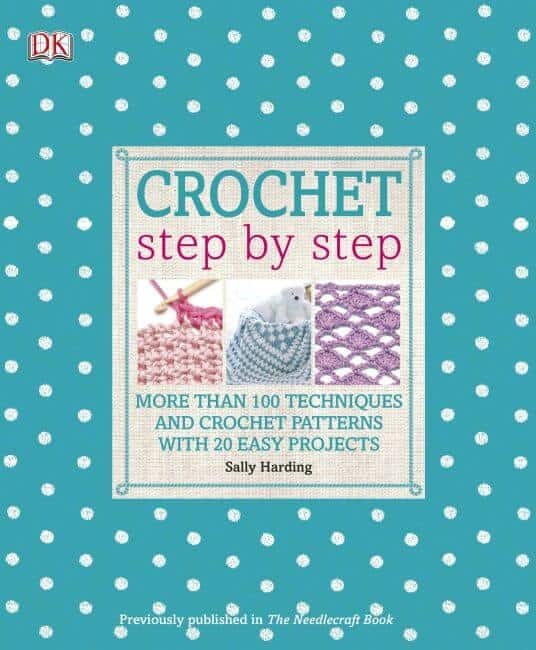 Crochet Step by Step is another craft book that all crocheters will appreciate. I use to crochet and this would be great to get me back into it. I need a new hobby. I tried my hand at crocheting a few years back and got lost in my project. I think this would be a great way for me to learn. I would love to win this for my sister who wants to learn how to do what my mom does so well. I have knitted but never crochet, have seen some nice crochet dolls which I would like to tackle. I only have real basic crocheting skills so would love to win to learn more! I would love to be able to learn and get started with crochet. I want to win this prize to learn how properly do crocheting and get some ideas! I love all different kinds of crafts and tried to teach myself crochet years ago. Now my teen daughters are interested in learning to crochet and this would be great for a craft activity for all of us. I would love to win this so I can learn crocheting with my students. I would like to win this as I really want to learn to knot amd crochet, so I can make college stuff for my daughter. I really love crochet, but I’ve only srarted to learn a month ago, so I know very little yet! It would so help! I love crafting and am teaching myself to read crochet instructions. I knit quite a bit but do not yet know how to crochet. This would be a great way to learn. I would love to learn how to crochet. I’d love to improve my crocheting skills. My daughter has started to crochet and I think these books would be wonderful for her to learn some of the techniques. She loves books and prefers a physical copy rather than online! I know how to knit but never tried crochet. I would like to learn how to crochet and I’m a very visual learner so this would be great. I have wanted to learn to crochet for awhile. These books look like a good way to start. My daughter-in-law’s mother, Terry, is very creative and “crafty” and makes wonderful yarn items, especially blankets for our grandchildren. She know a few basic stitches, and I’d love to gift her with these books so she can expand her skills. Retiring July 1st and need new projects to keep me busy. I recently began crocheting again and could really use a refresher! I’d love to win so I can get started on this hobby. It’s something I’ve always wanted to learn. I am new to crocheting, and I am excited to try my hand at it! I’m learning to crochet right now and I coulduse some easy practice projects! I would love to work more on my crochet skills. I could definitely use some help. Thanks! I have always wanted to learn how to crochet. This would be a great way to learn. I’d love to win because crocheting is something I’d love to learn. I’m on mat leave right now and it would be nice to pick up a new hobby while I’m home with my babies!! Because I’ve always wanted to learn to crochet and would love to share this with my niece! I’d love to win because I don’t know anyone nearby to teach me how to crochet! I need some clear directions for the finer points of crocheting. I’d like to get better at crochet and improve with easy projects. I love to crochet and want to be inspired to take my skills further with new techniques and stitches. I have started crochet and I need all the help I can get! I would like to win this prize because my 12 year old started crocheting this winter with my mom. She made herself a scarf and she would love more projects to work on! I learned how to crochet when I was younger but haven’t done anything in years…would love to get back into it and could use a refresher. I have wanted to learn, so this would be a great step! My sisters have made beautiful blankets and baby clothes crocheting and I would love to have this book to learn how to make them. I would love to learn how to do this properly. I have always struggled even with Youtube LOL. I learned in the past but would like a refresher course. My mom gave me her crochet needles years ago, but I didn’t bother to learn what to do with them. It would be a good time to start, while she’s still here to see my new creations. I have just started crocheting and would love to have more instructions to follow. I would love to get back into Crocheting. I always use to but that was before my kids arrived, many years ago and I would not know where to start now. I’ve been hoping to learn and engage in a new hobby. Crocheting sounds wonderful. My niece is starting to get into crocheting, so she would love this! Crocheting is the new skill I wish to learn so these books would be perfect! I want to win this because I want to learn to crochet. Love to win this to share with my daughters, who are just starting to crochet! Love to win because crocheting is relaxing.